I know... I know... pumpkin pie? Again? And since I'm going to tell you right now that the filling recipe hasn't changed, I can definitely sympathize. 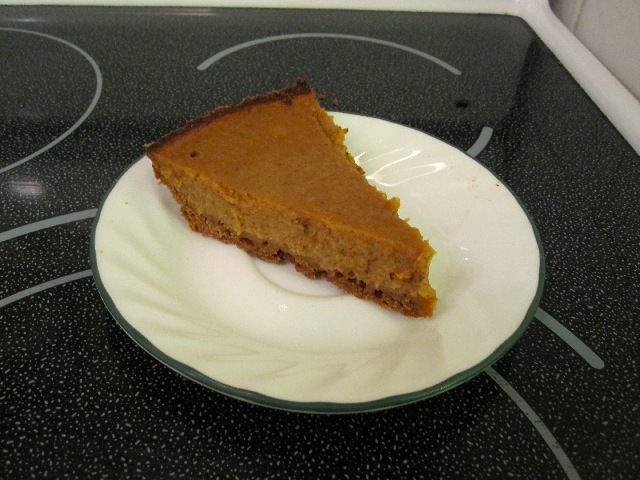 However, this pumpkin pie is significant for two reasons. It's also the heart warming story of how disaster became triumph; and how one tiny change brought hope for the future. Someone call the CBC we've got a movie of the week here. You see, originally I wanted to make this pie with a shortbread-esque crust. I wanted something that wasn't as sweet as a graham cracker crust, and something I could add a little salt to to play against the filling. Once I made the decision to go against the recipe (one that I had previously done) and increase two tablespoons of egg to one entire egg, disaster was inevitable. The crust came out of the oven as a cake, high and soft. I scraped it out of my pie plate and shoved it in front of my brother and father to eat. I needed a new crust and I needed it quick. 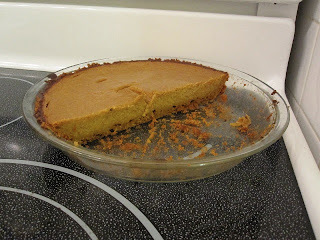 I decided on a regular graham cracker crust but with one notable difference, I added some salt. Once the pie came out of the oven and had ample cooling and chilling time it was ready to test. I portioned out the pieces and delivered one to my mother. A few minutes later, and before my first bite, she emerges from her room and says the following: “Adam! That was the best pumpkin pie I have ever had.” Now my mother has always been encouraging, but she's not prone to hyperbole. I was a bit wide eyed at that point. It was a big statement. There was one nagging thing, and it was again caused by the fresh puree. The pumpkin flavour just wasn't where I wanted it to be. But after the salty sweet pumpkin-y goodness that I have experienced, I just don't care :). Finally, a graham cracker crust I can get behind. Realistically, I don't think it would work with all pies, but I just had the crazy idea of using it with a pecan. Hold on, I need something to wipe the drool. I am going to try and recall the exact process I used to make the crust. Much of it I also retroactively added to the Chocolate Crumb Crust recipe. In a medium bowl whisk together graham cracker crumbs and salt. Add butter and stir together with a fork, making sure to fully incorporate the butter and all the crumbs appear to be damp. Press crumbs on the bottom and up the sides of a 9” pie plate. (I used a glass pie plate this time, which may have had a role in making the crust soft). Bake pie crust for 7 minutes. Remove from oven and allow to cool on rack for 45 minutes to an hour (don't worry if the crust isn't completely cool yet). Place in freezer for 30 minutes before filling. Refer to Pumpkin Pie w/ Chocolate Crumb Crust for filling and baking instructions.